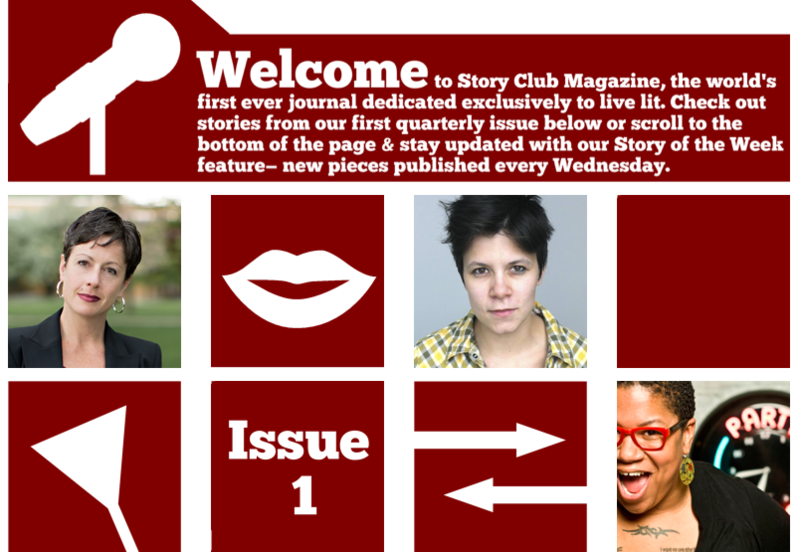 Story Club Magazine’s debut issue is available online now. Chicago’s live literature scene just became available in a new format, in case you haven’t made your way to a show in person. Now readers can peruse stories online, all of which have been performed before a live audience, thanks to Story Club Magazine. The quarterly magazine released its premiere issue last week, made up of stories performed not just at Story Club Chicago, but other live lit events in the area. It also features stories from performances in other cities, including those at Story Club Boston and Story Club Minneapolis. “We’re spreading the gospel of live lit a little wider,” said Dana Norris, Story Club founder and producer. Norris said the plans for the magazine came about this past fall. A former Story Club intern, David Lipowski, designed the clean-looking site from the bottom up. Another intern, Elle Kammerer, was interesting in managing and editing an online magazine, and Norris wanted to provide an outlet for her to do so. Sarah Hollenbeck, a live lit veteran who also holds a masters in creative writing from Northwestern, was a natural fit to be the magazine’s senior editor. Norris and Hollenbeck met at Northwestern in a creative nonfiction writing workshop. Norris founded Story Club in 2009, and today it is a cornerstone in Chicago’s thriving live lit community. However, she also has a background in publishing, including editing Northwestern’s TriQuarterly literary magazine. Content for the magazine is curated by the staff, and is submitted to them from the many Story Club outfits now emerging across the country. Stories performed at other live lit events are also permitted. “We take the ones we think are the most dynamic and put them in the quarterly issue,” said Norris. Other stories will be posted as “stories of the week,” available with new content each Wednesday. The movement is expected to only grow: Story Club Atlanta and Story Club Indianapolis are both in the works, with interest building all the time. Norris said she welcomes new chapters, and it’s an easy format to replicate city-to-city. “Just have an open mic, pay your dues, and follow the brand, which is ‘openness’,” she said. Holenbeck was an observer of live lit for years, she said, before stepping up the mic. Today, she can boast being on the stages of Guts & Glory, That’s All She Wrote, Story Club North Side, and Fillet of Solo. Her boyfriend, Andrew Marikis, runs Story Club South Side in Bridgeport. She recommends the experience to any and all writers and performers, and credits Norris with being a warm, understanding leader into the medium. She is glad the magazine will be available to archive stories and further the reach of live lit. If you’ve never seen Story Club yourself or if you’re interested in performing, read about their (minimal) guidelines here. Story Club meets the first Thursday of each month at Holiday Club, and Story Club South Side performs on third Tuesdays. Meryl is a journalist and southeastern Ohio transplant who loves binge-watching shows on Netflix, listening to upbeat indie music with starkly depressing lyrics, and shamelessly ordering the Kids Pack-size popcorn at the movies. She has been known to over-share on her blog, and she is okay with that.